If there’s ever been a word that’s underused, wouldn’t you say it’s peripatetic? 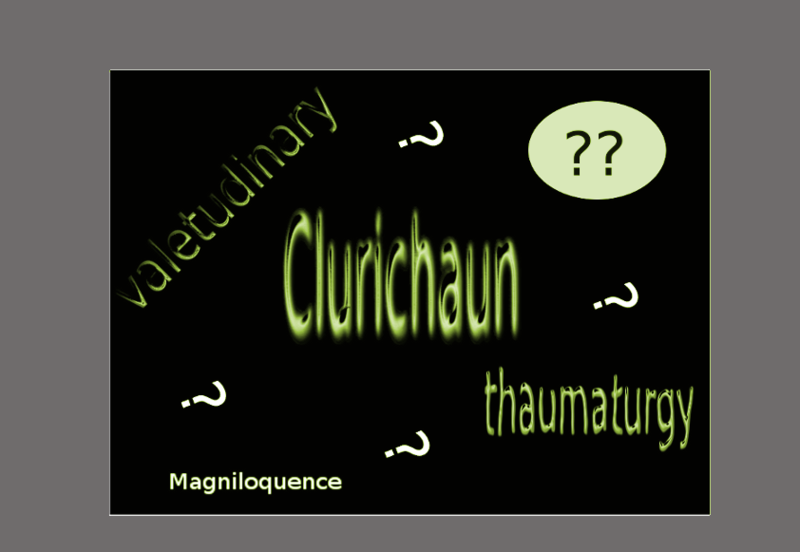 You should see clurichaun in any decent story that spans more than a couple pages, and what sermon would be good enough without a reference to thaumaturgy thrown in? They’re damned good words. You can look up thaumaturgy if you want, and no – I’m not going to tell you what it means. Really, this is part of what you buy when you invest in a really good thesaurus. The words at the top of the story are so obscure that my WordPress spell checker doesn’t know about them. Well, maybe that’s not saying much. I use a thesaurus regularly, but I’ve never used any of the words I wrote into the first paragraph. I use a thesaurus not to find obscure words, but to find simple ones that do a better job of explaining my stuff. At one time I possessed fifteen different thesauruses and dictionaries. All but thirteen of them were a waste of both the shelf space and the time I spent thumbing through them. I definitely have a strong opinion on this matter. The only thesaurus I think is worth the occasional hangnail is a book that’s not even called a thesaurus. Notwithstanding the name, it’s the best “thesaurus” you’ll find, if you count my opinion for anything. I use the J.I. Rodale Synonym Finder. It’s inexpensive (18.99 is what I paid, which is a lot less than many other books of lesser value. Again, my opinion may not cut much ice for you). No, I’m not connected to the company, in any way. I’m just relaying hard-learned lessons won by hard earned money. You can spend yours as you like. Forget the “Collegiate this/Collegiate that” thesauruses. I found them to be of little value. Just my opinion. Never mind the online thesauruses. They are so weak as to be maddening.